Kaplan's GRE Subject Test: Psychology includes score-raising strategies, practice questions, and test information to help you face the exam with confidence. This updated edition reflects test-maker changes and is aligned with the DSM-5 (Diagnostic and Statistical Manual of Mental Disorders). 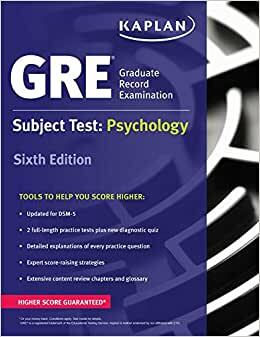 Kaplan is so certain that GRE Subject Test: Psychology offers all the review you need that we guarantee it: After studying with this book, you'll score higher on the GRE psychology test—or you'll get your money back. We know the test: The Kaplan team has spent years studying every GRE-related document available. Kaplan's expert psychometricians ensure our practice questions and study materials are true to the test. We invented test prep—Kaplan (www.kaptest.com) has been helping students for almost 80 years. Our proven strategies have helped legions of students achieve their dreams. For 80 years, Kaplan Test Prep (www.kaptest.com) has been helping students grow their knowledge, skills and confidence so they can be their best on Test Day. Our prep books and online resources provide the expert guidance that students need at every step of their educational journey – incorporating years of test-specific data and strategies tested by Kaplan students and our own expert psychometricians. After helping millions of students, we know what works. Our guides deliver knowledge with clarity and simplicity while focusing on the specialized strategies that keep test-takers ahead of the clock and at the top of their game. We offer preparation for more than 90 standardized tests – including entrance exams for secondary school, college, and graduate school, as well as professional licensing exams for attorneys, physicians, and nurses. With a full array of self-paced and live online courses, as well as print books and mobile apps, you can use Kaplan to study on your own schedule and at your own speed. Kaplan’s private tutors and admissions consultants supplement those offerings with one-on-one support. I studied for 2 weeks and I was so frustrated when I walked out from the test room. I heard that this book included at least 90% knowledge for GRE psy but it has not. Those who plan to take sub test, I highly recommend you going back to ETS official test content to check all the knowledge on that and learn more stuff. I'm giving this book 5 stars because it accomplished its intended purpose - I studied pretty much exclusively out of this book, 3 years removed from my psychology classes, and scored in the 95th percentile on the test. Particularly helpful to me was the social psychology section - I never took a social psych course in undergrad, so the material was pretty much all new to me and using just this book I scored very well on the social psych portion of the test. I don't think this strategy would work for someone who had no background in psychology, but as a review it worked well. Names of individual researchers are for some reason super important on the psychology GRE, so the page at the end of each chapter listing key figures made for a good resource to make flash cards out of. However, I found the book itself to contain a lot of errors, both typographical and substantive, that made the study process rather annoying. The information is intended to be review, so it's understandable that the authors don't go into great detail for most concepts. But many ideas were summarized so poorly that I couldn't understand what even the basic features of them were - stating the name of a theory without any further information about it, for example, so I used the book as jumping off point to do better research online (Wikipedia came in very handy in these spots). A few explanations were flat out wrong, which is frustrating as you then have to teach yourself incorrect information just to score better on the test. The list of key figures at the end of each chapter sometimes contained names that don't appear anywhere in the chapter, which happened infrequently enough for me to suspect that these were errors. I know this is a new version of the book, but I sure hope they hire a good copy editor for the next edition. That being said, if your goal is just to score high on the test, going through this book, taking notes on it, and supplementing any unclear areas with Wikipedia will do fine. Don't do it all in two weeks - I spread my studying out over a few months - but you won't need much more than your basic psych education and this book to score well. I will say that in my opinion the practice questions in the book are unfortunately a good bit easier than the actual test questions, so I wouldn't use them exclusively. Therefore you may want to take the practice test provided by ETS online for a better benchmark of your performance. Remarkably ill-informed with respect to the actual content of the test. I used this to prep for the Psych GRE for the Fall of 2016 and was immensely frustrated walking out of the test. Not only does it only pay lip-service attention to aspects of the test that are/were tested heavily, it also blatantly steers studiers in the wrong direction (mentioned that the GRE typically only covers four personality disorders that the book detailed - I had multiple questions about others). I used this book for two months to prepare and was very disappointed. My review is primarily about the book but also with a few tips on how to use it and some supplementary study methods. This is a decent (but not exhaustive) study guide for those who are not psych majors and have maybe taken a few psych classes at one point. 5.0 颗星，最多 5 颗星Representative of test material. The most important thing is that this book was representative of what was on the test. I have no background in psychology (not so much as even an intro to psych course), and I’m 8 years removed from my undergrad in engineering. This was my only source of test prep, other than the ETS practice test. I don’t know how I did on the test yet, but I learned a lot reading through this book, and even if I couldn’t recall the answer, I know that all the questions on the test were addressed in this book. There will probably be an update soon, but the only misinformation I noticed is about the scoring. Up until the 2017/2018 test year you would be deducted 1/4 point for a wrong answer. This is no longer the case. There is no penalty for a wrong answer. This book did not have a couple of main sections that ETS outlines as being topics on the test (including IO/Educational Psychology and Clinical Psychology besides disorders). The sections it did have were not nearly inclusive enough and did not cover some key theorists.